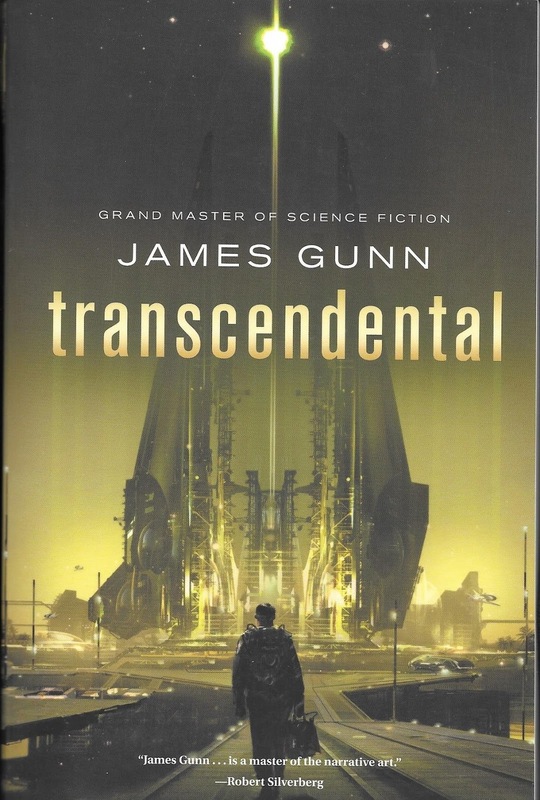 When one titles a book “Transcendental,” it’s probably a good idea to start our review with a clear definition of that word. Our trusty old Webster list it as an adjective; 1) or relating to transcendentalism. (The philosophical belief that knowledge of reality comes from intuition rather than from objective experience.) 2) rising above common thoughts or ideas; mystical. Confused yet? Maybe looking at the root word transcend can help clarify things a bit more. It is defined as 1) to pass beyond (a human limit) 2) to exist above and independent of (material experience or the universe) and 3) to surpass. Set in the far-far future, mankind has encountered many different alien races representing the spectrum of our natural universe; animal beings that look like elephants; flower beings that stand on tall stalks and whose roots are mobile. There is even a machine race. Then the various empires fought each other in decades old wars until reason and sanity won out and peace was established. Still, the quest for knowledge is so ingrained in the nature of all sentient beings, ultimately that seeking creates a quasi religion surrounding a so-called Transcendental Machine. And therein lays the crux of James Gunn’s fantastic plot in which a group of aliens from the furthest reaches of the known galaxy come together to journey beyond known space in the hopes of finding this wondrous Transcendental Machine. Riley, a cynical ex-mercenary is kidnapped by unknown parties and has an organic computer implanted in his brain. If he refuses to obey this “pedia” it will kill him. He is told to sign aboard the spaceship Geoffrey about to undertake that trip. On the ship are representatives of the various galactic races each hoping to experience instant evolution to a higher state of being via the Transcendental Machine. The “pedia” also informs him that one of the passengers may be the rumored Prophet, the only being to ever find the machine and be transformed by it. It is believed the Prophet is traveling with the expedition to determine which of the travelers is worthy of undergoing the change. No sooner does the group assemble at the space ladder taking them to the Geoffrey then an attempt is made to sabotage their launch. Then, shortly after passing through the first nexus jump point, a passenger is found murdered in Riley’s cabin. Why are we here? What is our true purpose? Is there a higher evolutionary step in our future? All these philosophical questions surround a standard suspense thriller in this truly unique narrative. Gunn’s depiction of the various races is imaginative and compelling. One of the classic faults of most science fiction has always been, according to critics, our inability to accurately understand something alien. We can only ever interpret this world via our own human limitations. Whereas Gunn’s tale argues quite powerfully that all species born of the same physics will ultimately share the same perspective inherent in the same nature, be rocks, vegetables, or flesh. One universe equals one truth. 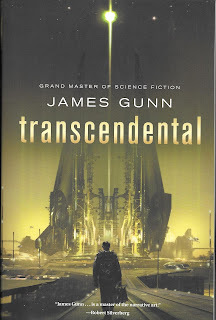 In “Transcendental,” Gunn invites us on a journey to discover that truth, no matter how beautiful or frightening. Ever heard of a round robin? A round-robin story, or simply “round robin,” is a type of collaborative fiction or storytelling in which a number of authors each write chapters of a novel or pieces of a story in rounds. They were invented in the 19th century, and later became a tradition particularly in science fiction. Having been personally involved with several round-robin projects, we can attest to just how difficult they are to pull off and most of them begun are never completed. Conflicting egos, styles of writing, etc. etc. all are factors in undermining a project that demands a strict adherence to one narrative plot. Round-robins are easily derailed for dozens of reasons. 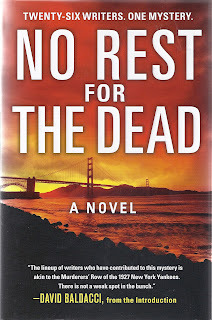 Which is why when we stumbled upon “No Rest For The Dead,” in an old bookstore last year, we were immediately intrigued by the dust-jacket’s claim that 26 writers had successfully come together to create gripping murder mystery. Was it true? Did the book actually work? We took a chance, bought a copy and hoped for the best. Rosemary and Christopher Thomas are curators of a well established art museum in San Francisco. Their marriage is falling apart thanks to his wandering eye. Aware of his unfaithfulness, Rosemary threatens to divorce him. Christopher warns her that should she do so he will fight for custody of their two children; thus assuring he maintains his hold on Rosemary’s inherited wealth. When Christopher disappears soon after a public confrontation at the museum, the police are ultimately called in as a matter of routine. Months later his body is discovered in a Berlin museum folded into a medieval torture device known as an iron maiden. What is left of it, that is. Only through a single tooth and pinky finger are the authorities able to identify the liquefied remains as those of Christopher Thomas. Soon after Rosemary is arrested, tried and convicted of his murder. She is sentenced to be put to death by chemical injection. And that, dear readers, is where this mystery begins, at the execution of Rosemary Thomas. Present are her closest acquaintances including her alcoholic brother, Peter, and Detective Joe Nunn, the cop who’s testimony help convict her. It is a riveting scene and one that propels the tale. Ten years pass and Nunn learns there is a memorial service planned for the anniversary of Rosemary’s death to be held at the museum. Invited are the same select group who were present at her demise. For Nunn, the intervening years have been haunting as he never truly believed Rosemary killed her husband thus his guilt for helping to bring about her death has destroyed both his marriage and career. With the news of this gathering, the ex-cop begins to wonder if it may be a way for him to reopen the case and not only prove Rosemary’s innocent but eventually find the real killer. As the date of the event draws nearer, he begins to suspect that, if he is correct, that killer may be among those invited to participate. 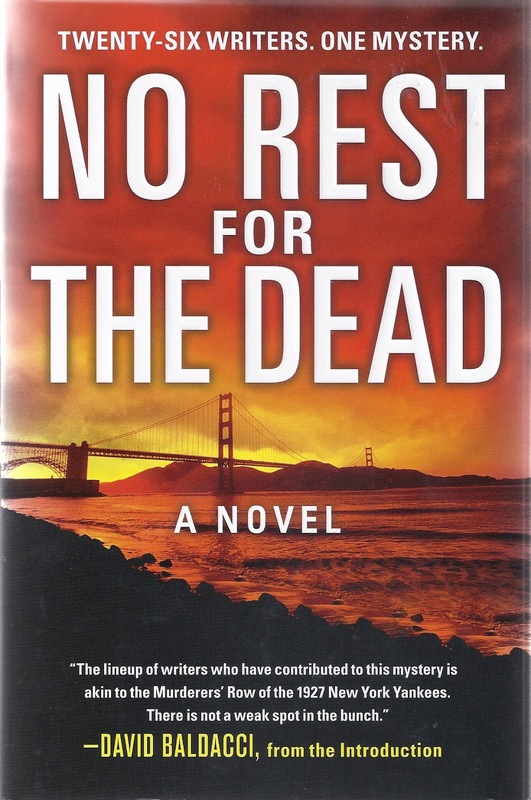 From its first page to its last, “No Rest For The Dead,” is a truly masterful, intense and beautiful crafted mystery. That 26 different writers were involved with its creation is nothing short of mind-blowing to this reviewer. All mystery novels should be this good. And so let us end with a tip of our pulp fedora to the 26. This is one series we came in late on, not having been aware of Max Collins’ hitman Quarry until Hard Case Crime convinced him to bring the character out of mothballs for one more tale; “The Last Quarry” in 2015. We were hooked instantly and obviously not alone in our appreciation as the publisher continued releasing new Quarry tales. By this time Collins had long since established himself as one of the premier mystery writers in the country. This was due in large part to his historical Nathan Heller crime novels and his posthumous collaborations with late Mickey Spillane in which Collins completed many unfinished Mike Hammer mysteries. 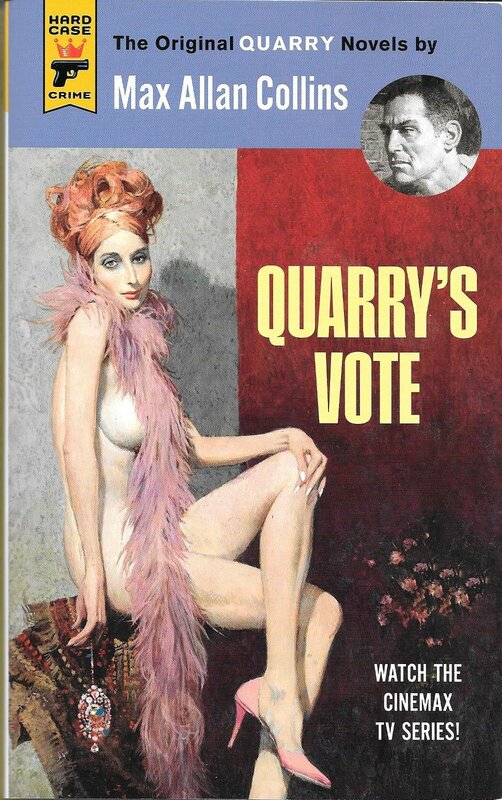 And still, despite these truly wonderful books, Quarry, in our opinion, is Collins’ most successful series. A fact now bolstered by the forthcoming TV series being produced for the cable outfit, Cinemax. In lieu of its premier, Hard Case Crime is reprinting the original Quarry novels first released in late 70s and early 80s. “Quarry’s Vote,” first published in 1987 as “Primary Target,” is one of these. As the story opens, Quarry has quit the killing game, married and settled down. He’s also about to become a father for the first time. One day, while his wife is away, he is visited by a stranger wanting to hire him to assassinate a radical political figure running in the current presidential race. Quarry is offered the sum of one million dollars to take the job; the largest such payment he’d ever been offered. Still, because of the contentment he’s finally found in his life, he turns the job down. Days later he feels anxious about his decision, beginning to worry that his turning down the hit will have dangerous repercussions. Tragically his haunting premonitions become reality and everything he held dear is taken from him in an act of cruel savagery. Having the survived this attempt on his life, Quarry sets out to find those who have targeted him and wreak his own brand of retribution. Pulled back into his life as an agent of death, he sets about proving that his years away haven’t dulled his skills in the slightest. He is the embodiment of the relentless Reaper and woe to those who find themselves in his path of bloody vengeance. “Quarry’s Vote,” is Collins as his best, delivering a top notched thriller with a dark, twisted lacing of black satirical humor that weaves itself through his depiction of modern politicos from both sides of the aisles. And it’s returning in this particular year of such a outlandish presidential contest couldn’t be more fitting. We’re only too happy to cast our own vote for this Quarry ticket. As you should be. 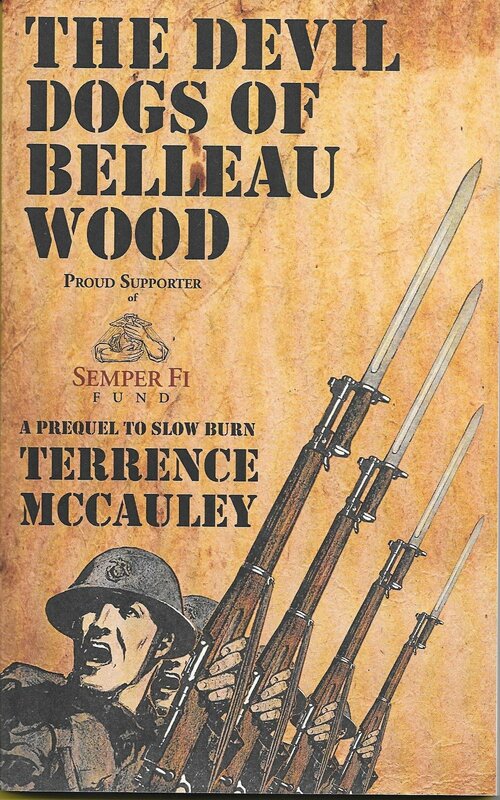 “The Devil Dogs of Belleau Woods,” is a gripping war adventure set during one of the most brutal battles of World War One. Corporal Charlie Doherty is a New York City cop who thought he was a tough guy but when he finds himself in a pitched battle alongside a handful of U.S. Marines against an overwhelming force of German troopers, he quickly discovers the true meaning of grit and courage. The book opens with Doherty the sole survivor of his company after a hellish battle with the enemy. Alone in its aftermath, he founds himself lost in the dense forest of the Belleau Woods pinned down by a machine-gun nest. Then two gutsy Marine officers arrive on the scene; Capt. Devlin and Lt. Barrows. Devlin, though young, is a seasoned warrior and quickly directs them into taking out the German gun. Soon the trio hook up with a group of other lost Marines led by a grizzled Sgt. Ambrose. Devlin believes the enemy is going to make another push to break through their lines and they may be the only force in the area capable of repelling them. When they find a small, isolated French farm, Devlin decides it is the place where they will make their stand. Their objective, to hold back the advancing Germans until reinforcements can arrive. McCauley’s prose is terse and straight forward. His fighting scenes are savage without being sensational. He paints the horror of warfare with a detached, clear reporting and captures the pain, suffering, courage and ultimate sacrifice that are part of combat. 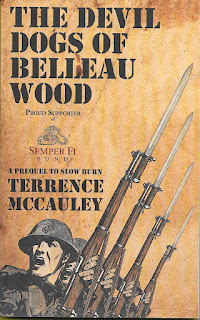 We haven’t read a war book this good since Richard Matheson’s “The Beardless Warriors.” For a small volume it packs a solid punch proving once again that Terrence McCauley is a rising star in today’s fiction. Not to be missed.